Summer can be brutal…and I’m not talking about the heat. More than 1 in 5 kids are food insecure. I know that I have been writing about this topic a lot this summer, but I am floored by the fact that there are families living right in our neighborhoods with empty refrigerators, empty cabinets and empty bellies. The classmates of our children. Our people. Donate Food: When you’re at the grocery store already dropping a hundred bucks or more on your weekly food for your family, if you can, add some items from your area food bank’s most-wanted list. To find a food bank near you, visit Feeding America’s local food bank locator. Host a Food Drive: Your school, moms’ club or organization can host an effective way to help hungry families. Summer clubs, Vacation Bible Schools and day camps are all great opportunities to host an easy food drive. Send flyers home, collect needed items for your area food bank and you are done, son. Many food banks will even coordinate pick-up of your donated items. Donate Produce From Your Garden: Usually have zucchinis and tomatoes growing out of your ears in the summer thanks to your veggie garden? Don’t give ‘em to your fancy neighbors, donate them to the food bank – fresh produce is of particular need to hungry local families! Volunteer: If you and your children have time this summer, make an appointment to lend a hand as a family! You can find a volunteer opportunity on the Feeding America Volunteer Match tool. Donate $: Of course, donations of cash to Feeding America and the food banks are always much appreciated, and is the most efficient ways to support non-profits. Social Media: Other simple, no cost ways we can get involved are by following #ChildHungerEndsHere on Twitter, and follow ConAgra Foods on Facebook and Twitter. Watch a Video: One crazy simple thing we can do is to watch this video with celebrity dad spokesperson, Chris O’Donnell, a father of five committed to the helping families in need. Every time this video is viewed or shared with our friends on social media, the monetary equivalent of one meal will be donated to Feeding America. In addition to individuals like us, organizations such as ConAgra Foods Foundation also assist in feeding hungry children during the summer; their Child Hunger Ends Here program has made a $5 million commitment to summer hunger support with Hunger-Free Summer grants to food banks. These local food banks will then stock the cabinets of needy family’s homes with more than 2.5 million meals and snacks this summer. 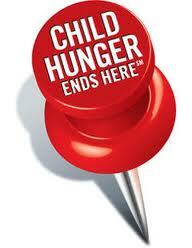 I am proud to serve as a blogger spokesperson for Child Hunger Ends Here for a third summer.